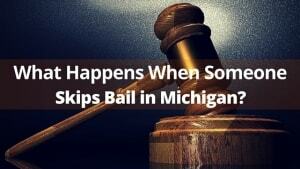 What Happens When Someone Skips Bail in Michigan? Thinking of Skipping Out on Bail in Michigan? Think Again! You’ve posted bail, you’ve been released, and your court appearance is tomorrow morning. But – rather than show up in court, you decide to ‘jump bail’ and head for the high country. Well – guess what? You’ve just made your whole situation worse than what is was before posting bail! It’s not a great idea and if you read below you will soon understand why it’s a bad idea to think about. Once the court finds out that you have missed your court date, they will immediately revoke your bail, issue a bench warrant for your arrest, and demand full payment of the bail bond. This means that the police now have the right to enter your property, do a search of your car or home, and take all the steps needed to bring you back to court. So while you may not get caught right away, don’t decide to run a red light or be careless and get in an accident. You will definitely come up on their radar for an outstanding warrant. Since your bail bond company put their faith in you and are now aware that you decided to skip out, the bail is their liability. The bail bond company will now have to send skip tracers out looking for you which means you are, once again, on the ‘wanted’ list. Michigan has a fugitive recovery program where someone is hired to locate and retrieve you or anyone who has fled their bail and court dates. The State of Michigan does allow ‘bounty hunters’ as they are sometimes called, to go after any and all bail jumpers. Michigan bounty hunters are not ‘regulated’ by the State and therefore have a great deal of flexibility in using whatever means or tactics they deem right in order to get the best results. Those results have only one outcome – to find you or any other person running from bail and bring them back to the courts. Jumping bail will also jeopardize family and friends. Now the police, the bail bondsman, and the bounty hunter has the right to question those family members and friends about bail jumper’s whereabouts. It also means that if someone else signed the bond agreement, he/she or they are now fully responsible for paying out the money, either cash or offered collateral. Skipping bail may also mean extra money has to be paid out because of all of the extra work to find you and bring you back to court. Once a person is surrendered back to the courts: (a) the person’s record will now contain the notation of being a bail jumper, (b) additional bond money may be incurred because of being considered a ‘flight’ risk, and (c) bail may be totally revoked and you will have to sit in jail until your new court date. Yet, you may have a good reason for missing your court date. If you were sick, you need to have a doctor’s note. If you were in an accident, the accident report will be proof enough. But remember – it is up to you to go to the courthouse and your bail agent and show ‘why’ you missed your court date. Once you show good cause, the court will arrange another court date and your bond will stay active and in place. While it is no fun having to show up in court, in the long run, it is the best way to avoid added warrants, trouble and adding another ‘black mark’ on your record. So, if you have questions or Our mission is to help you or your loved ones get out of jail, in the quickest, most efficient way possible. All of us at Detroit Bail Bonds understand that this is a difficult time and we want you to know that our staff will be there for you and your family. Keep our number handy and don’t wait until it’s too late. This entry was posted on Monday, December 7th, 2015 at 2:25 am and is filed under Bail Bond Process. You can follow any responses to this entry through the RSS 2.0 feed. You can leave a response, or trackback from your own site. It is best to show up to your scheduled court appearances on time for many reasons. Thank you for sharing this helpful information.